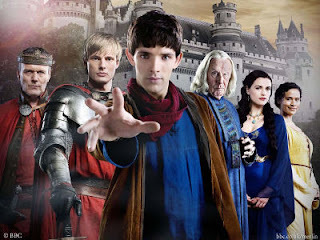 *Anyone else watching "MERLIN" on NBC? I ended up watching it on Hulu & am LOVING this show!! It reminds me of a cross over of Buffy & Charmed with the magic... but with the old King Arthur /Camelot feel! And even better - Arthur's father is still king - & he is played by GILES from Buffy!!!! It really is good... check it out! I'm keeping fingers crossed it doesnt get canceled - but Sunday night time slot.... probably not the best! *Look at this that one of the girls drew at church... isn't this the funniest thing EVER? Poor Ryan (the drawing in the center) - he said "I didnt realize you hated me so much!".... the boy on the end said "I look like a Chinese woman"... Me, I was just glad I had a tiara on!!!! *Barbie has joined Jazzercise! Honestly! This girl came in - she just moved here from Florida - she is blonde, looks totally like Barbie with the perfect body....& to top it off - she had on WHITE SPANDEX pants.... who wears white pants & looks good? She does.... if I wore them... this is exactly what I'd look like! *Bachlorette Fragment! - I loved Jake even more for coming back & looking out for Jillian... but what the heck? Is this woman nuts???? She STILL chose Wes? I literally am loosing my voice every Monday from SCREAMING at the TV!!!!..... & poor Michael & his twin! He is the most adorable little thing! Even when he said "For the girl who broke my heart, I have nothing bad to say".... just the cutest!!!! *off to go furniture shopping.... have a great Friday!! Did I mention YIPEEE - I'm off work! Hope you all are too! Enjoy your time off from work. I love furniture shopping! I just became the 100th person to follow you! Yeah! Enjoy your day off and furniture shopping. Sounds fun to me! I am going to be catching Merlin on Sunday. My DVR missed it for soms reason last week and the premier too. I loved the alien dance, but that is totally my style of dancing. I grew up dancing and my specialty is contemporary. I love really odd and dark dances like that. LOL. I like Evan and Randi, but not as much as I liked Evan with his brother. He is losing that spark to me. I feel like Randi isn't fully in it anymore. Haven't watched that show I will have to look into watching it. I haven't been watching the Bachelorette either but I did catch it that night and even having not watched it I could tell something was fishy about Wes. Have fun furniture shopping. White spandex pants? That's definitely a NEVER.